Wow, it's been quite a while. 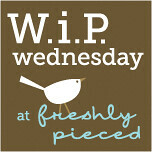 But what better way to reintroduce myself to the blogging world than to do a WIP Wednesday entry and link it to Kati's guest post at Freshly Pieced? In mid-June I made a point of finishing up some big projects in order to get ready to leave town for a few weeks. I had some quilts to complete and pack off to send to Sisters, OR (more on that in a later post) as well as fulfill some Etsy orders. I still have lots of work yet to do on this puppy (or rather poppy), but am happy with the progress I made while in Greenville, NY. And coming back to reality, my only time in the sewing studio since returning home was dedicated to finishing my June bee blocks for Eileen, in the Friends + Fabric Bee. She chose a paper piecingtutorial from Nydia who blogs at The ADD Crafter, Basketweave Braid Star Block. Though not complex, this block is definitely a time-sucker. But on the plus side, it was TRULY a scrap-buster as well - I could work exclusively from my basket of strips up until adding the white background pieces. So, I feel like I've been taking a summer hiatus which began about a month before summer. And it may continue longer than I'd like, but 'tis the season for family visits, gardening, cycling, and making up for a Vitamin D deficiency from the last 8 or 9 months! But do please bear with me and I promise to get back into the swing of things and hopefully find new inspiration to share soon!